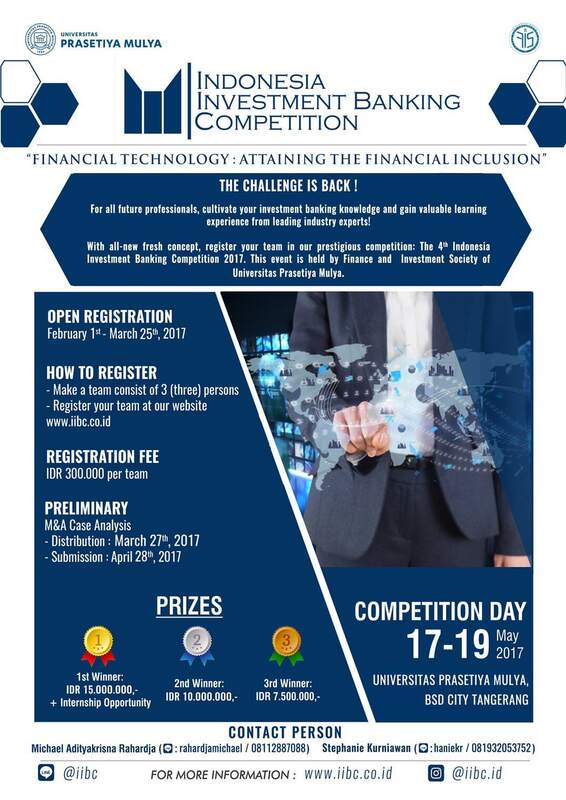 Finance and Investment Society Prasetiya Mulya proudly presents "IIBC 2017: Attaining the Financial Inclusion"
Last year, over 100 teams from top 23 universities all over Indonesia have participated in IIBC 2016. This year IIBC 2017 is back with all-new fresh concept – Financial Technology as a new breakthrough in financial industry! Form a team of 3(three) people, then simply register your team through our website www.iibc.co.id and WIN a total prize of IDR 32,500,000,- + Internship Opportunity in Top Financial Services Companies! 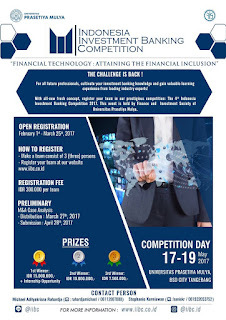 0 Response to "Indonesia Investment Banking Competition 2017"